Applicants can enter the moose hunt lottery once per year. A bonus-point system improves the chances for unsuccessful applicants who apply in each consecutive year. Each point translates to a chance in the drawing. For example, last year the overall odds of a resident applicant being drawn were 1 in 76, while resident applicants with a total of 15 points had a 1 in 34 chance of being drawn. For nonresidents, the odds increased from 1 in 359 overall to 1 in 164 for applicants with 15 points. Your chance of being drawn and offered a permit in the lottery will improve if you rank all wildlife management units on your application. You will have the option to decline a permit if drawn for a unit you prefer not to hunt. In 2018, 6,142 people entered the lottery for the chance to win one of 51 permits. More than 1,200 people continued to accrue bonus points because they submitted an application for a point only in order to not lose their accrued points. Hunters from six other states won permits in the lottery. While people travel from all over the country to take part in the New Hampshire moose hunt, the majority of permits, about 85%, are awarded to New Hampshire residents. The number of permits available to nonresidents is capped, based on the prior year’s sales of nonresident hunting licenses. Bonus points are tracked via your driver’s license number. Please pay particular attention when completing your application, and if your license number has changed, indicate this on your application. NH Division of Motor Vehicles started a new driver’s license number format in 2017 so New Hampshire driver’s license numbers will be changing over the course of the next five years. New Hampshire’s nine-day moose hunt starts the third Saturday in October. This year’s hunt runs from October 19-27. 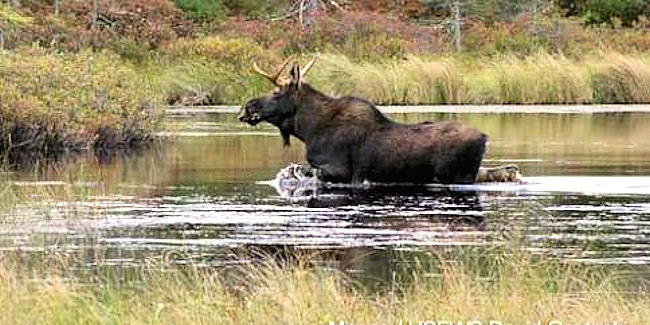 Learn more about moose hunting in New Hampshire at www.huntnh.com/hunting/moose.html. If you want to hunt moose in New Hampshire this fall, now is the time to enter the 2019 moose hunt lottery and try your luck on the adventure of a lifetime -- hunting moose in the rugged woods of the Granite State. Applicants are encouraged to apply online and early, so there is less chance of submitting an incomplete application. Moose hunt lottery applications for 2019 must be postmarked or submitted online by midnight Eastern Time on May 31, 2019, or delivered to the Licensing Office at NH Fish and Game Department Headquarters before 4:00 p.m. that day. The lottery entrance fee is $15 for New Hampshire residents and $25 for nonresidents. A total of 49 permits are proposed to be issued this year. Winners will be selected through a computerized random drawing on June 21 at Department headquarters. To enter the New Hampshire moose hunt lottery, visit www.huntnh.com/hunting/moose.html where you can enter online or print out a mail-in application. You can also pick up an application at any New Hampshire Fish and Game license agent, New Hampshire Fish and Game Regional offices, or at New Hampshire Fish and Game Department Headquarters, 11 Hazen Drive in Concord, NH.